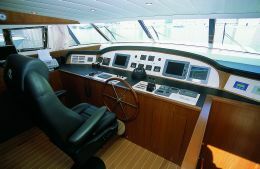 After the 1980's race to achieve the highest speed the large motoryacht sector has returned to its senses, once more offering style, elegance and comfort rather than heightened performances. So, almost in parallel with the new era of refined slow food which includes the proposal to recover ancient flavours, here we have displacement cabin cruisers coming back into the limelight. No longer commuter vessels useful for linking two waypoints - those of departure and arrival - in the shortest possible time, but floating homes where you can experience the sea in accordance with its natural rhythms made up of dawns and sunsets, silent crossings and tranquil moments at anchor. Seen with the shipyards' eyes this new request from the market is at the same time enticing and demanding, since making a displacement hull in no way means just under-powering a planing one: rather it means espousing a completely different design philosophy and acquiring specific technical abilities. Over about thirty years of activity the Gianetti yard has demonstrated on several occasions that it possesses this agility and is ready to follow - and sometimes even condition - new market orientations. 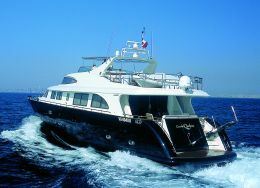 So it is no surprise that its already considerable range of cabin cruisers has been enriched by no less than three small ships of 21, 24 and 32 metres. The model 24 S stands at the hinge-point between the boat and ship categories, a long range ocean cruiser that can sail non-stop for more than 1.500 miles at a speed of 12 knots with her engines - two Caterpillar C18s of 1.015 HP each - scarcely 45% under load. If one thinks that with these conditions consumption is just 140 litres per hour, it is easy to understand why it would be inappropriate to press ahead to reach the maximum 16 knots, a speed paid for by a more than doubled flow of diesel. 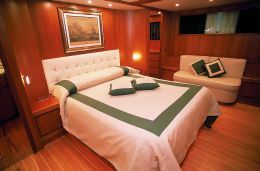 As regards the interior decoration, this yacht is available in three standard versions as follows: 5 or 6 guest cabins for the so called two-family; 4 for the "classic"; and a suite with lounge/study, a VIP cabin, a guest cabin and a skipper's cabin for the "owner's" version. 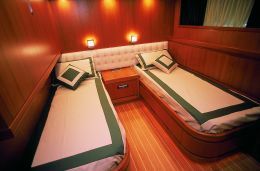 In all three cases there are two double cabins for the crew, and the technical areas such as the bridge, the galley, the engine room and the stowage space remain more or less unvaried. 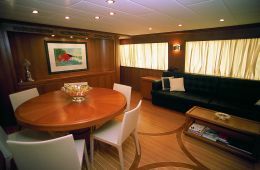 Special mention must be made of the saloon in the vessel we visited, an example of sober elegance wedded to rationality. Here subdivision of the spaces is purely functional, with the dining area consisting of a round table seating six and an L- shaped saloon. Almost as if to function as a wing, on the forward side a fine console element leaves space for two symmetrical side corridors: the one on the port side leads to the galley and the one on the starboard side to the cabin area. 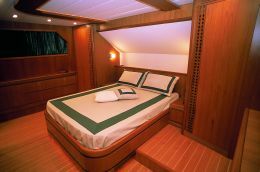 Though the comfort of the cabins is of a high level it is easy to imagine that the best place to be while under way - especially in fine weather - is the flying bridge. It is actually a mixture of what, on cruise ships, is called boat-deck and sundeck: an extensive open space, far from the subdued drone of the engines (in this case really low)where life aboard can be lived in its most varied forms. 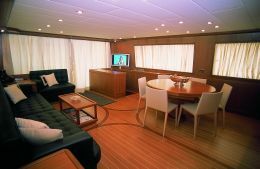 And in this case too, separation of the guest area from the technical - consisting of a slightly raised command bridge - is more virtual than effective, re-proposing the same sense of space that is felt below deck. 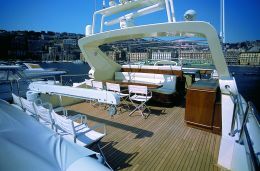 Continuing from the architectonic point of view, it is interesting to note that the indoor bridge - of a clearly professional layout - is located at an intermediate height between the deck bridge and the flying bridge, precisely along the passage that leads from the former to the latter: the skipper thus has immediate access to the vessel's most important operational zones. On this subject we point out the two small manoeuvring stations (with levers for the inverters and a joystick for the bow propeller) placed in strategic positions: one at the aftermost end of the flying bridge and the other, extractable, in a cavity in the cockpit.